If you’re lucky enough to be friends with Marco Fraticelli – a haiku poet from Montreal and publisher of the famous Hexagram series with King’s Road Press – you probably know that he sends out haiku postcards every year. “Twice a year (new year & summer), I send out a postcard to my haiku friends. I have done this uninterrupted for the last 28 years,” confessed Marco in an e-mail to me last December. I had heard about these mythical postcards that Marco was sending, but I had never seen one. Marco quickly sent me a package containing a selection of a dozen postcards dated between 1993 and 2014. It was great to receive so many cards at once, as it allowed me to see the evolution in formats and style. “In some cases, the back of the postcard is relevant but in others I just used free postcards given out by the Quebec liquor Board as a [promotional] vehicle,” wrote Marco. Not only are Marco’s poems good, but the use of rubber stamps adds a touch of colour. The fact that the poems are handwritten, dated, numbered, as well as signed by hand, makes this a collectable piece that haiku poets and friends will cherish. It was a nice surprise when Marco contacted me in December 2014 regarding an idea he had for his upcoming New Year postcard. He asked if he could buy 100 copies of my little book “Seven Stages of Writing” to send out to his friends as part of his “New Year haiku greeting card” series. “This year I thought I might do something entirely different and send out your book with my haiku written on the back.” I immediately agreed. I sent him the file (after deleting what was on the back page so Marco would have room to write his haiku) and Marco printed the book (in color! 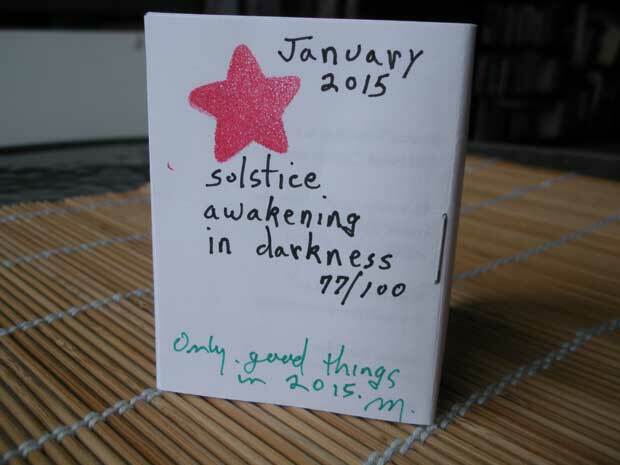 ), assembled it, wrote a haiku in the back, signed, dated and stamped it, to finally mail it on January 13 2015. I really like this idea of sharing haiku through the mail. “It’s hard for me to believe that I have been sending them out uninterrupted summer and winter all these years,” wrote Marco. 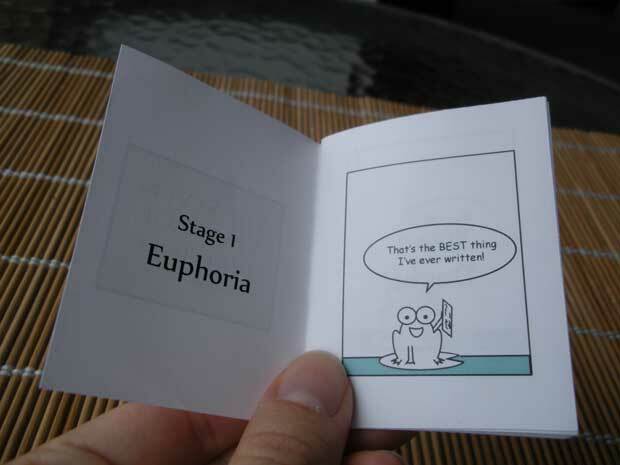 “Yes, they have evolved and if this project works, your mini-book will take them in a whole new direction.” I hope you enjoy the gift of my little book… brought to you by the amazing and generous Marco Fraticelli. 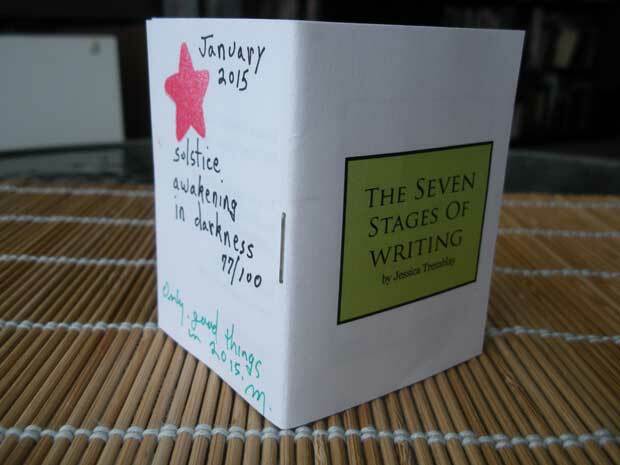 If you did not receive a copy, you can purchase the original zine The Seven Stages of Writing (b&w, without Marco’s poem) on my online store.